Winner of the EDRA book prize for 2012. In cities around the world, individuals and groups are reclaiming and creating urban sites, temporary spaces and informal gathering places. These ‘insurgent public spaces’ challenge conventional views of how urban areas are defined and used, and how they can transform the city environment. No longer confined to traditional public areas like neighbourhood parks and public plazas, these guerrilla spaces express the alternative social and spatial relationships in our changing cities. With nearly twenty illustrated case studies, this volume shows how instances of insurgent public space occur across the world. Examples range from community gardening in Seattle and Los Angeles, street dancing in Beijing, to the transformation of parking spaces into temporary parks in San Francisco. 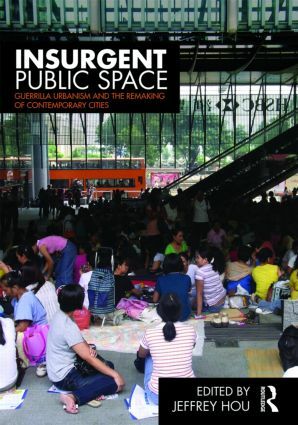 Drawing on the experiences and knowledge of individuals extensively engaged in the actual implementation of these spaces, Insurgent Public Space is a unique cross-disciplinary approach to the study of public space use, and how it is utilized in the contemporary, urban world. Appealing to professionals and students in both urban studies and more social courses, Hou has brought together valuable commentaries on an area of urbanism which has, up until now, been largely ignored. Jeffrey Hou is Chair and Associate Professor of Landscape Architecture at the University of Washington, Seattle. His research and practice focus on design activism and engaging marginalized social groups in the making of public space. He received his Ph.D. in Environmental Planning and M.Arch. from University of California, Berkeley.